The W. M. Keck Observatory, located on the summit of Mauna Kea on the island of Hawaii, takes advantage of its high altitude and stable atmospheric conditions to engage in advanced research into the deepest regions of the universe. 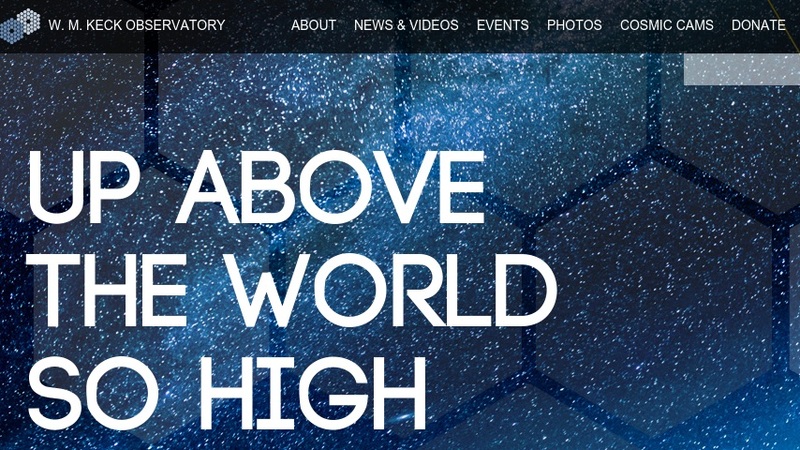 The observatory's website includes information on its two ten-meter telescopes, their revolutionary segmented mirrors, and some of the research programs currently under way. There is also information on the observatory's research communities and their allocations of observing time; how to apply for time, and information for scheduled observing teams. The site's news and outreach page features archived press releases and links to the observatory's newsletter and "Cosmic Matters" magazine. The educational page includes podcasts of the observatory's astronomers discussing recent discoveries, information on field trips and class visits, and information on the family ASTRO program. Photos of the instruments, the observatory site, and a selection of remote images captured by the telescopes are collected in an image gallery, and there is also a bibliography of articles referencing data collected at the observatory.